Over the last eight years the Conservatives at Suffolk County Council have made massive increases to care charges, whilst cutting many services. Schools, care homes, public transport and libraries have all suffered. Costs have still increased and efficiency has stagnated. At the same time they have built up the County’s reserves to a massive £150m – a THIRD of their annual budget – stashing our cash despite historically low interest rates and falling confidence in the banking sector. 1. Bring back Quality Education Eight years ago, Suffolk had an enviable education system. After eight years of Tory mismanagement the County is almost bottom of the English league table. 3. Recognise transport as a human right Neither Labour nor Tory party has demonstrated active support for the public transport network – particularly in rural areas. Yet reliable travel is essential for work, health, socialising and education. 5. Safety for all our Library service Under the Tories the situation of Suffolk Libraries has been perilous. So, not a big ask, surely? But the Tories haven’t managed it! This is just a brief post to alert people that the East Anglia ONE consultation concerning the proposed onshore cabling from the proposed offshore windfarm finishes on 6 March. Please respond with your concerns. 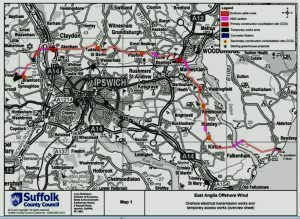 The proposal is for buried cabling – which many consider more aesthetic than pylons, but which will be cutting a 55metre-wide swathe across a significant distance of unspoiled Suffolk coastal countryside: from Bawdsey, across the Deben estuary, travelling north past Newbourne, Waldringfield, tunnelling under across Martlesham creek, and turning west on our very own Sandy Lane, where there will be a ‘Primary construction consolidation site’ whatever that might be. 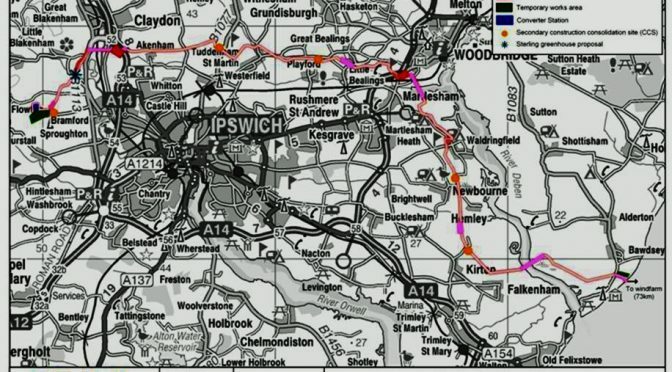 It will then tunnel under the A12 and travel the length of the Finn Valley, past Little Bealings, Playford, Tuddenham St Martin, and Akenham, before turning south to Bramford. 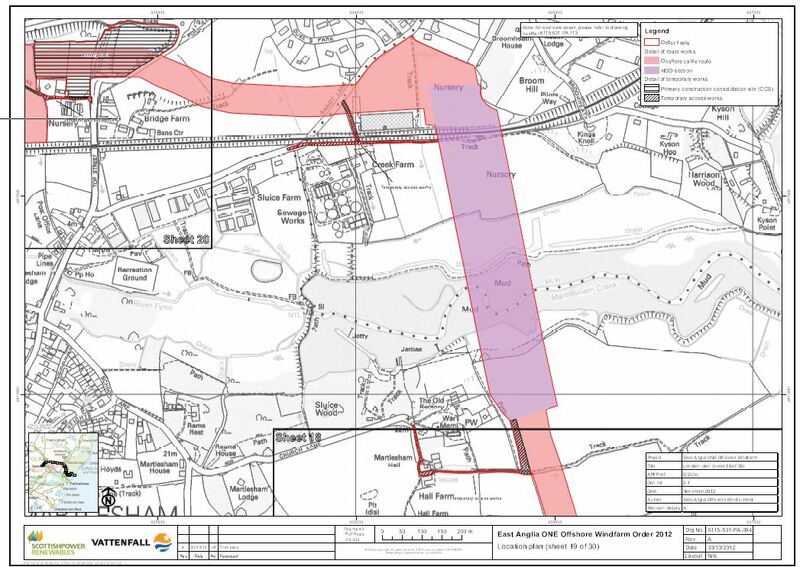 May I repeat that this will cut a swathe 55m wide for most of the distance between Bawdsey and Bramford, with a temporary access road along the whole length; that it will remove ancient trees (particularly, East Anglia ONE acknowledge, in Newbourne and Martlesham) and there can be no tree replanting over the top. 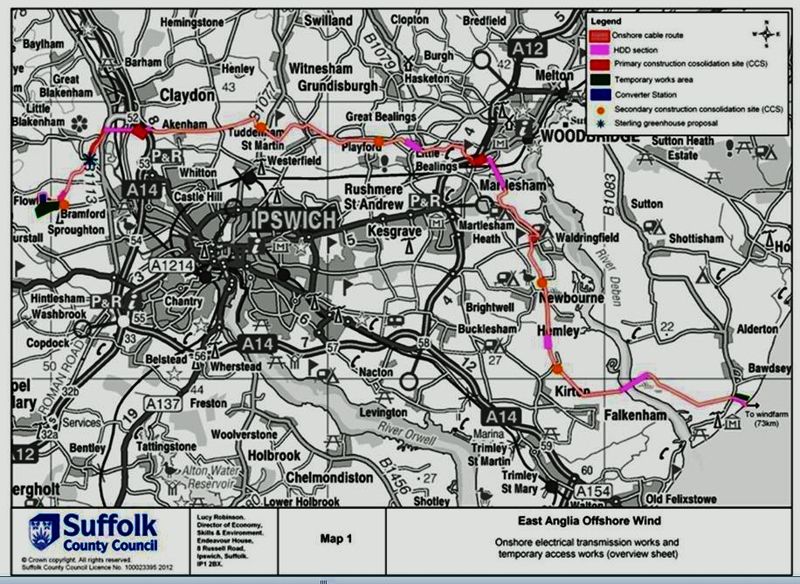 It may be that this will have a greater impact on portions of the route than pylons. We know of no pylon that is more than a few decades old – some of the trees what will go may have lived for centuries. The planned works will take place over a couple of years, from, I think, 2015. During the time there will be a considerable impact both on– and off-road. I’m not talking only of the valued footpath infrastructure, but the fact tht these works will cross-over with the proposed Sizewell C building – and the proposed large-scale housing development at Martlesham. Rather a triple whammy, tourism-wise. I will be responding on behalf of the people of Woodbridge as a whole. My interest will be in stressing the need for adequate mitigation (to put it mildly) and preventing as far as possible, negative impacts. As with the SIzewell consultation, my underlying feeling is that we should not be bearing the brunt of development for the good of the nation as a whole, without the nation recognising this, putting time and effort into ensuring minimum impact, and compensating us adequately for our kindness! Do contact me if there are issues you wish me to raise on your behalf. I see the BMA have put their mighty muscle behind preventing passive smoking in cars. As a reformed Fag-ash Lil – now 8 years smoke free – I have a lot of sympathy for the plight of the in-car non-smoker. But come on, BMA, put your money where your mouths are and admit it -it’s not just the cigarettes, its the people we should be getting out of cars! Why not collate all the damage done to people by passive and active driving? I’ll make a start. Let’s see, there’s: the breathing difficulties and chemical inhalation we get from exhaust fumes; the damage to life and limb from crashes and collisions (drivers, passengers, pedestrians and cyclists); other health risks to car drivers and passengers of hours of inactivity: things like obesity, heartdisease, back problems , family arguments; the environmental impact of air pollution, CO2 emission, oil spills and and diminishing public transport; and above all, the complete perversion of our infrastructure because people need to be near roads rather than services, have hard standing rather than gardens, and car-accessible supermarkets and shopping malls rather than local shops. Like passive smoking, all these have an undue impact on the ‘innocent’ : the children, the non-driver, the passenger, the cyclist, all those nationally or internationally who don’t partake but who suffer from the effects of those who do. And it wouldn’t be much of a stretch to assert that there are many many in the middle east who are currently passive victims of our horrible driving habit. If you cost up the impact of all of these ills it will be many many many times higher in both human and financial terms than the damage done specifically by in-car passive smoking. Legislation against the car itself would be a infringement of the right to choose -but one that would bring far greater benefits than the infringement caused by legislating against in-car cigarettes. So why has the BMA not gone down this route? Cynically I imagine that the number of car-reliant BMA members far outweighs the number who smoke. It is always easier to object to other peoples‘ vices, isn’t it? That’s why so many people are ambivalent about speeding. So come on BMA. Come on everyone. Lets stop being so partial and protectionist in our health messages, and tackle head-on the health damaging behaviours of the majority – that is, ourselves – the damaging behaviours that we contribute to and enjoy as well as those done by ‘other people’.